A nineteenth century, Wedgwood, Portland vase. 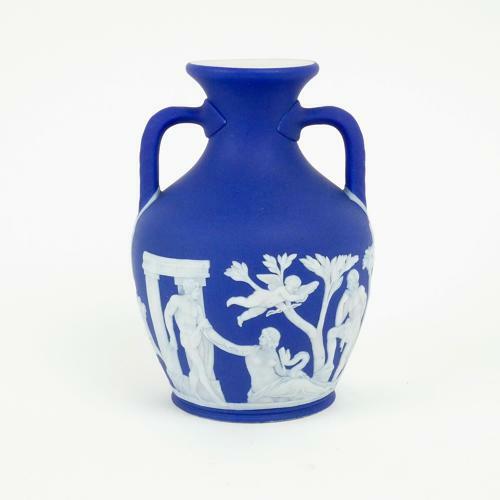 This is the design of vase which Wedgwood copied from the Roman ‘Barbarini’ glass vase. In a way it became his signature vase as it was used in various printed marks from the start of the 19th century. This example is made from a dark blue, jasper dip. It is marked with an impressed ‘WEDGWOOD’ and a large letter ‘D’ and it dates from c.1850. The reliefs are good quality, although there are some shrinkage cracks which can be seen in the images, and the dip colour is a rich shade of blue. The vase is in very good condition. Price includes postage with the U.K. and Western Europe. Shipping to the U.S.A. add £15.